Set on a peninsula caressed by the Mekong and Khan rivers, Luang Prabang is the former capital of Laos, a Communist-led country with a capitalist economy. 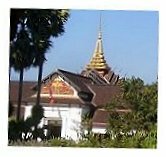 The Lao people, while being from a small, landlocked, French-colonized, American-bombed, and poor country, are remarkably friendly. One sociable Lao told me that he didn't want colonialism, to be sure, but was happy to retain the good parts of French culture, including baguettes and cakes. And more than once, I saw unexploded bomb casings - leftovers from the Vietnam War, which the Vietnamese call the American War and the Lao often call the Indochina War, still with their serial numbers and other identifying marks legible - being used for flower pots. 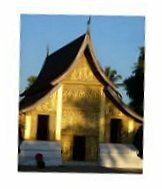 Luang Prabang is an enchanting little city, jam packed with charm and beauty, and has been designated a UNESCO World Heritage Site. It also has been designated a smoke-free zone and has a midnight curfew, both of which are routinely violated without incident by some tourists. A very walkable and scenic city, Luang Prabang contains many grand Buddhist temples, colorful outdoor markets, and intriguing art galleries. The city also boasts many restaurants and cafes, serving Lao, European, and fusion food and drink. While at this time there are unfortunately no strictly vegetarian restaurants there, vegetarian food is ubiquitous, abundant, and scrumptious, and it is quite easy to kin paak, literally to "eat vegetables" but meaning to be vegetarian. Some restaurants feature a vegetarian menu or a vegetarian set meal (e.g., l'Elephant, Café Toree, and 3 Nagas). Additionally, there are too many restaurants to name whose menus have vegetarian sections. It's easy to get delicious pizza, fresh pasta, garlic bread made with olive oil, and good wine. It's also simple to enjoy wonderful Lao food, which is closely related to Thai food. Tamarind Restaurant, for example, has a great vegetarian sticky rice dipping platter that allows one to sample various delicacies. And sample I did. At night, one can go to the popular, very inexpensive, outdoor, vegetarian Lao buffet, just off the main Sisavangvong Road. Separate from their buffet, they sadly and inaptly sell chicken-on-a-stick as their only non-veg item. They also sell good spring rolls, both fried and fresh, with a delicious sauce that they make fresh for each customer. The self-serve buffet has several different noodle and vegetable dishes, as well as some fruit, with both plain and flavored rice. At your option, they will be happy - they smile a lot! - to reheat your food in a wok. Another great place to eat is Lao Lao Garden. While one can go there during the day, it is even more special to go in the evening. Sitting outside in a jungle-like setting with candle-lit tables, it was easy to feel the magic and romance of both the restaurant and the city. In addition to the vegetarian section on their menu, which also contains some Buddhist quotes and practical advice, they explicitly state that tofu, or simply no meat, can be subbed for nearly every dish. The Lao-style barbeque was exciting and fulfilling, with tofu, vegetables, noodles, broth, and sides of minced garlic, chili, lemon, and lime. The Stir Fry Coconut Vegetable was so extraordinarily tasty that the English language cannot adequately describe it. Having a most delightful evening, I accompanied the meal with a glass of wine made from local fruits. Aside from sit down meals, it's quite easy to get and enjoy vegetable sandwiches on soft baguettes, with or without Laughing Cow cheese and with or without chili sauce. Some sandwich vendors even have tofu. When in Luang Prabang, one could also grab a snack from a vegetarian noodle street vendor, or have a coconut, or savor some pineapple or papaya, or try some seasoned river weed, or choose from a variety of muffins and mini-cakes (from taro to mango and many more), or have a fruit shake in any combination you want. Or, like me, have it all!